August 23, 2018 | -by: Kevin George. With the advancement of technology, mobile phones are getting smarter day by day. The desktop-centric approach is changing with each day as people are using smartphones to stay updated with news. In the same way, people are now more and more accessing emails on-the-go. Going by Litmus reports, 55% of emails are now being opened in mobile phones. If content is the soul of your email, the subject line is the door to that content. Unless the subject line is appealing for your subscribers, they won’t make the efforts to open and read the content in the email. With more than half of the people reading emails on their phones, good subject line should be a priority. It has been found that the number of sent and received emails per day in 2017 was 269 billion, in 2018 – 281 billion and the stats is expected to rise in coming years. Therefore, you must make sure that your email stands out in the crowded inbox and this can be effectively done by writing an enticing subject line. Subject lines are meant to quickly grab recipient’s attention. It has been found that subject lines with less than 30 characters have higher open rates. Work on designing good subject lines that are interesting, precise, have a clear message and can get your subscribers hooked. Do not make your subject line look clichéd. Know what interests your audience. Assure that you don’t make your subject lines look like a promotional phrase. Make it look more personalized. Refrain from using misleading subject lines. Sometimes to woo the subscribers, marketers take it way too far. In such a case rather than connecting with the subscriber’s need and emotions, we end up losing their trust and interest. So, try not to use deceptive subject lines that can backfire at you. Never craft a clickbait subject line with RE: or FWD: just to increase the opens for your promotional email because it would mislead the recipient that the email is a part of an ongoing conversation. Always remember that a mobile user does not have much time to invest in a particular email. So, a good subject line is the only way to grab their attention. The principle that applies with mobile subject lines is 2-2-2. First 2 – The first two seconds decide the fate of your email. In these two seconds, make sure that you get the desired attention from your customer. Second 2 – It represents the first two words of your subject line. Your subject line should emphasize on these words as they instantly grab the subscriber’s eye balls. Third 2 – This is the most important aspect of creating a subject line for mobile devices. It is for “today”. It means how important is your mail for today? What importance does it hold for your customer and why they should open it? Don’t send unnecessary information that has zero relevance with the current scenario. Tempt them with subject lines they can’t say no to. Remember that it is important that you create an urgency while promoting your offers. Don’t make your promotional emails boring. For ecommerce websites running limited time offers, it is a good idea to use subject lines like, “Few hours left to grab your 50% off deal”. This way, you make sure that the ball stays in your court. But make sure not to use this trick very often as it might not fetch you good every time. With the increasing popularity of email marketing, it is the need of the hour that you start sending right emails. Writing good subject lines is the basic rule of email marketing world. Now, use this platform to ask relevant questions to them. For Example, instead of asking the question in the email content ask them in the subject line. Such subject lines can considerably increase your open rate. Ignoring the pre-header text is not a wise move. Pre-header text can actually turn out to be useful for you as it serves the purpose of explaining the content of your email to the recipient and hence, your email gets noticed quickly. It is the first line copy of your email. Therefore work well and work wisely on your pre header text. Always remember that your pre header text should complement your subject line. Images and graphics will always have your subscriber’s heart. Don’t we all love creative and images more than plain text? So, try giving a shot to emojis in your email subject line. While drafting subject lines for mobile devices, the main challenge is word constraint. With limited set of words, it becomes easy to convey the message through emojis. Out of all the emails, the one with the subscriber’s first name in the subject line will surely get noticed better. Personalized subject lines always get more open rates. Study and analyze your recent customer’s data such as recent purchase, recent actions, and activity so that you can use it to write more relevant subject lines. Remember you will get the best results only when you know what is working the best for your audience. Don’t send emails without testing the subject lines. It is important that you make sure what is working the best for your audience. There are many tools that allow you to test your subject lines before you even send them. These tools tell you how likely the subject line is expected to perform. For example, you can use Email subject line grader. This tool is free to access and checks the overall effectiveness of your email subject line. Such as type, balance, word count and word mixture. You will also receive a numerical score on how compelling your subject line is. You can even carry out A/B testing to evaluate two different variations of the subject line used for the same email. Your customers love straightforward and honest subject lines, and in order to get more open rates, a mobile subject line should be crisp and to the point. What do you think about these tips? 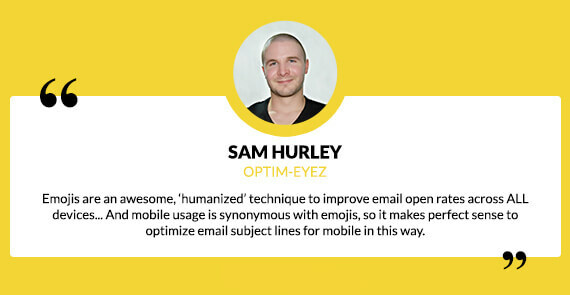 Have you tried any innovative subject line ideas to cater to the mobile users? Looking to boost your ROI? Monks are here to help.